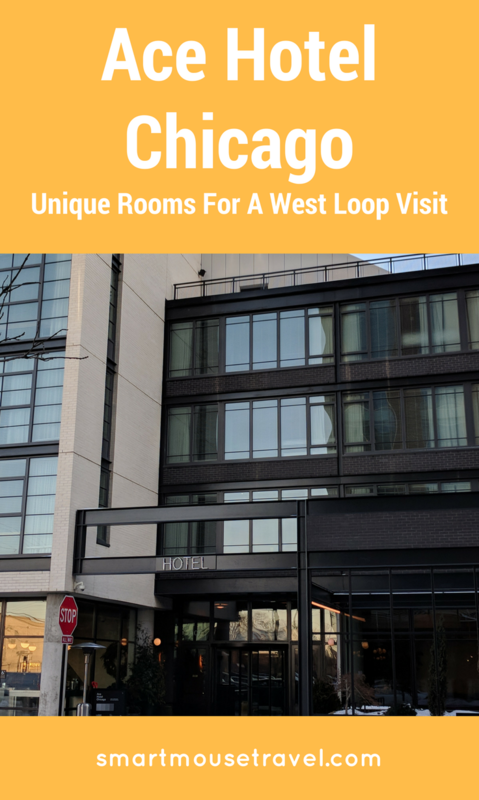 The West Loop of Chicago has transitioned from the meatpacking district of old into a vibrant hot spot full of amazing places to eat and drink (plus is the home of Google Chicago). This area saw a marked increase of restaurants, bars, and offices over the past few years, but no hotels. That’s why when Ace Hotel Chicago opened late summer 2017 it became a key part of my anniversary night out plans. Ace Hotel Chicago is located directly across the street from Google’s Chicago office and near The Aviary, a unique and renowned lounge. Ace Hotel Chicago has a quirky, modern, industrial feel. The rooms and hallways have exposed concrete and unfinished wood. This styling gives the appearance of a revamped old space despite Ace Hotel Chicago being a newly constructed building. Please note: Ace Hotel Chicago is pet friendly. We saw several small dogs at the hotel during our stay. This may be great for those wishing to bring their small dogs with them but may be problematic for guests with severe allergies. This restaurant is open for breakfast, lunch, and dinner daily, and is found on the main floor of Ace Hotel Chicago. Obviously, I needed to eat here during our stay. We already had dinner and drink reservations for the evening of our arrival. Therefore, we opted to have breakfast at City Mouse. Mr. Smart Mouse and I each ordered the traditional 2 egg breakfast with bacon, hash browns, and toast. 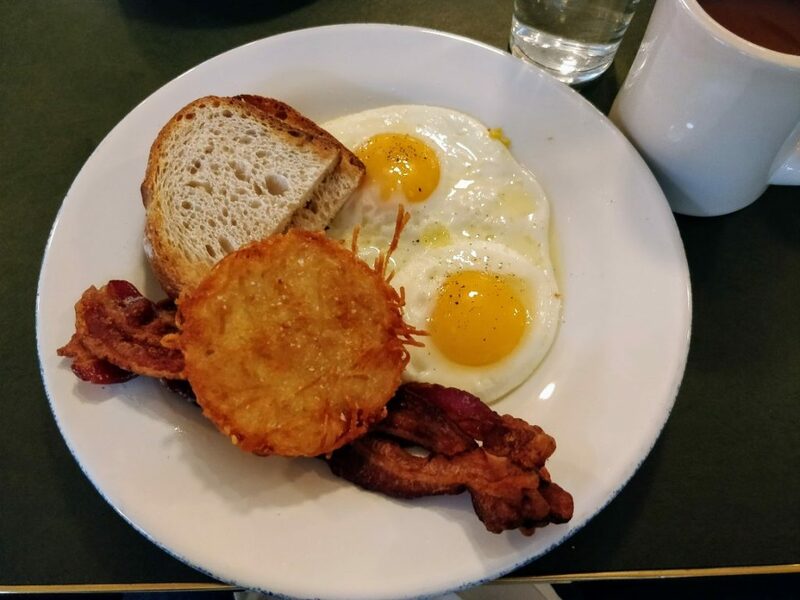 The coffee was strong, delicious, and paired perfectly with our breakfast. Breakfast was so good I ate everything on my plate and even used my toast to sop up all the egg. This rooftop bar and lounge is found on the 7th floor of the Ace Hotel. It offers many beer, wine, and cocktail options along with a handful of food choices. This indoor lounge is very large and also has a great outdoor rooftop section for when the weather is nice. This cute cafe can be found just inside the main lobby of the Ace Hotel Chicago. It offers many coffee options and also has pastries provided by City Mouse. 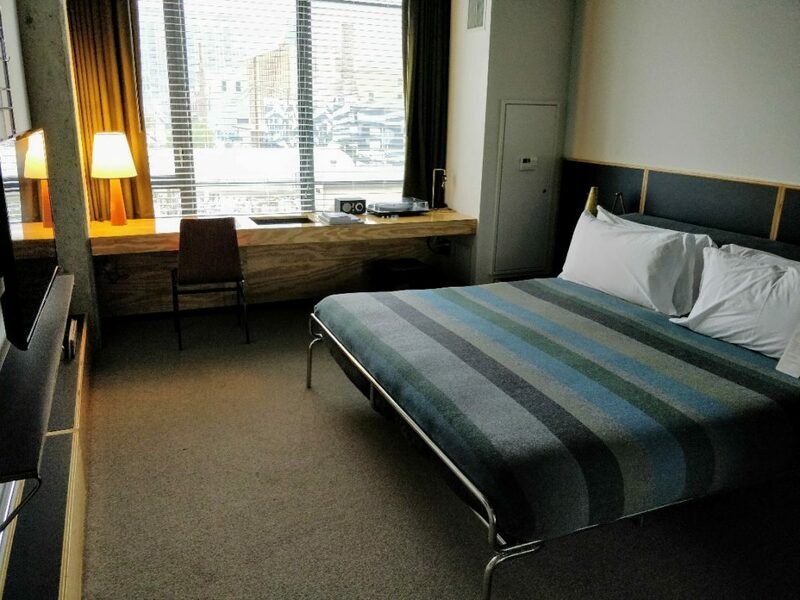 Ace Hotel Chicago offers several different room types: small, medium, medium skyline, double, large, loft, and Ace suite. We opted for a basic medium room for our stay. The medium room was plenty big at 315 square feet (29 square meters) and contained a low frame king-size bed. The bedroom area also has a long desk along the window. One of my favorite features of the room was the custom bluetooth radio. This radio plus free wifi meant I could stream all of my favorite music while I was getting ready. 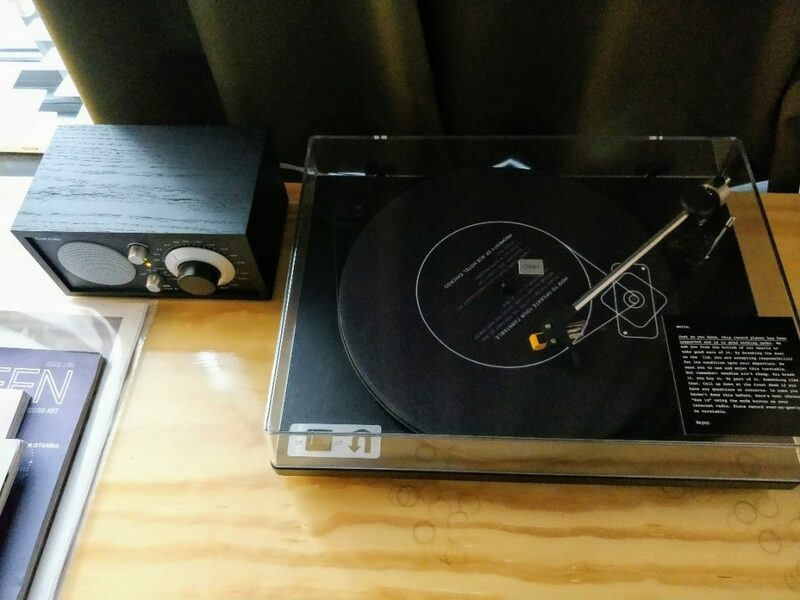 Rooms also come with either a turntable and small assortment of vinyl records or a Martin guitar, which certainly adds to the quirky vibe of Ace Hotel Chicago. The room had a coffee maker and a stocked mini bar (which we did not use) despite several appealing choices. 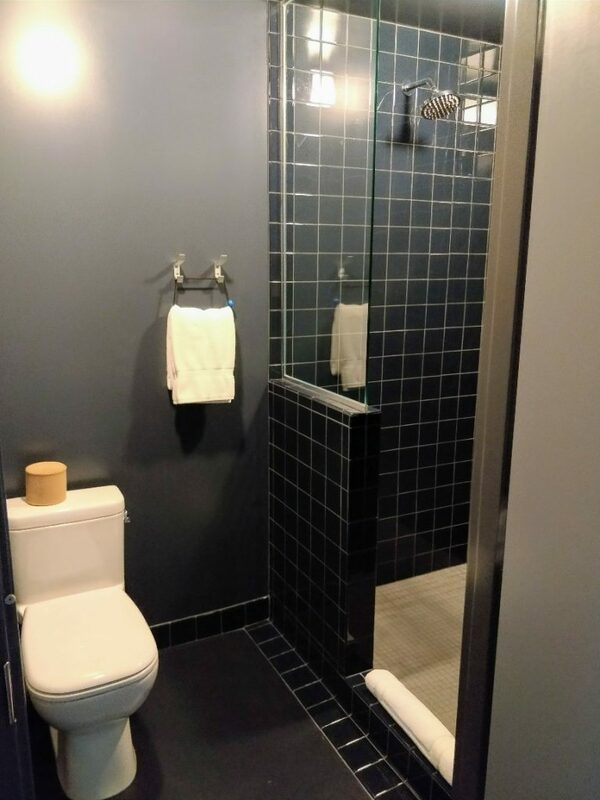 The bathroom setup has a large shower with bulk toiletries and the toilet in one room. The sink is located just outside. 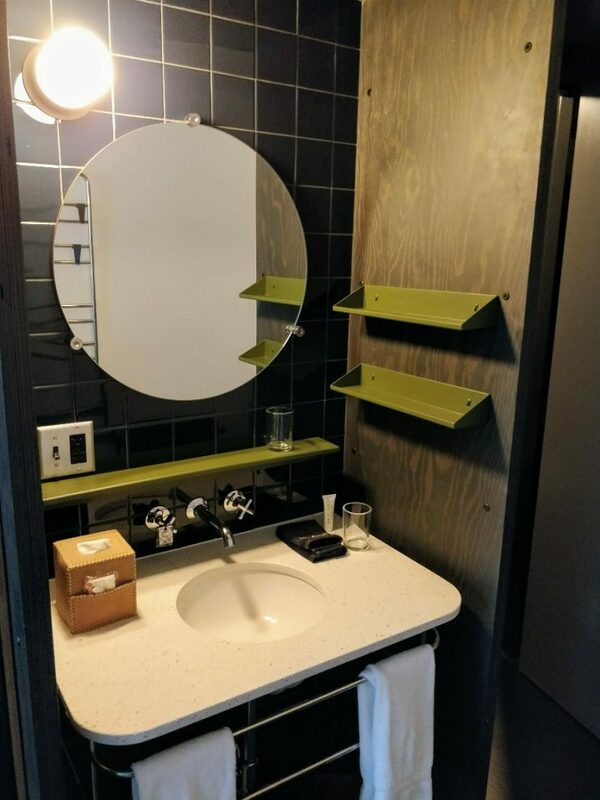 Although the sink countertop was small, Ace Hotel had added shelves to the wall next to and in front of the sink. These shelves provided plenty of usable storage for all of my items. 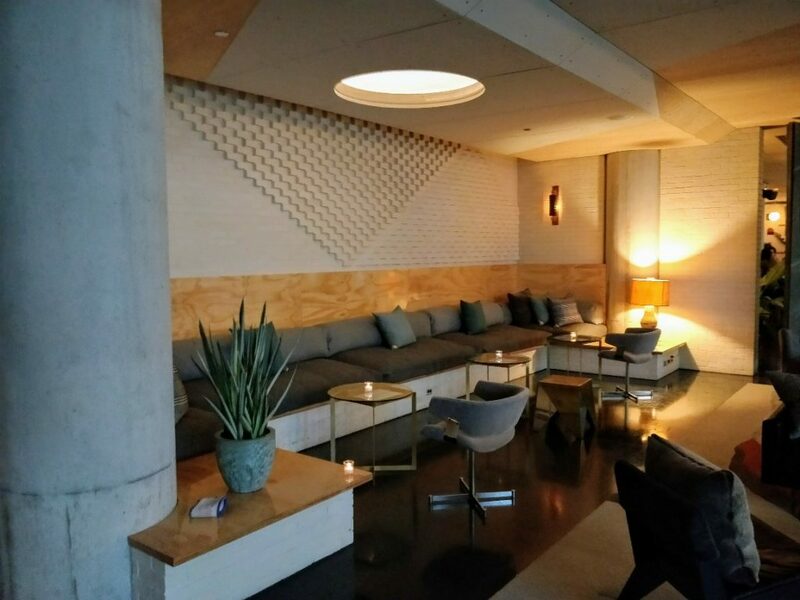 Parking at Ace Hotel Chicago is valet-only, whether you are a hotel guest or stopping by for a meal or drinks. Check their website for pricing information. Ace Hotel Chicago was a cool, quirky place to stay in a fantastic location for what we had planned. If you are looking for a traditional luxury hotel experience I think you will be disappointed, but I thought it was a fun change of pace. The staff was super friendly and the food and drink choices within the hotel are great. 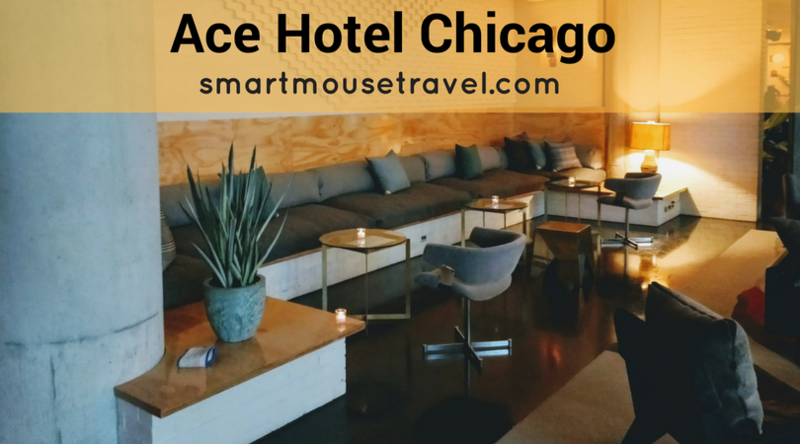 If we planned another West Loop Chicago dinner and drinks night I would absolutely stay at Ace Hotel Chicago again. I love boutique hotels – this looks perfect for a kid free night in the city!